Kbhvn. : Schultziske Officin 1820. Med kobberstukket titelblad med stor kobberstukket vignet visende Nysøe mod haven samt udfoldeligt kort over Jungshoved. Elegant marmoreret eksemplar indbundet med helt guldsnit i helbind med rød saffiansryg med smuk tidstypisk rygforgyldning; guldborter langs kanterne samt indvendig guldbordure. I kassette. Med egenhændig dedik. : "Til Deres Kongelige Høihed Kronprindsesse Caroline, allerunderdanigst fra Forfatteren"
The Odyssey of Homer. Translated by Alexander Pope, esq. To which is added, The Battle of the Frogs and Mice. Albany, N. Y.: D. Steele. Good+. 1820. First Edition. Hardcover. Title continued: "TOGETHER WITH THE RISE, PROGRESS AND EXISTING STATE OF MODERN AGRICULTURAL SOCIETIES, ON THE BERKSHIRE SYSTEM, FROM 1807 TO THE ESTABLISHMENT OF THE BOARD OF AGRICULTURE IN THE STATE OF NEW YORK, JANUARY 10, 1820'. In December 1791, Elkanah Watson proposed to the New York State legislature that natural waterways could be used to create what later became the Erie Canal across New York State, connecting the Hudson River and New York City with the Great Lakes. Later he competed with Dewitt Clinton for the credit for this concept. In 1792, with General Philip Schuyler, Watson formed a company to build locks and canals, starting with the canal at Little Falls, New York, about halfway through the Mohawk Valley where the river had rapids that prevented through traffic. Blue paper covered boards, cloth spine with label. Front hinge is cracked with cover firmly attached. Light foxing throughout. [ (iv) ,210pp (2) ] , Pink endpapers. Portrait frontispiece, engraved title page. Two maps one of which is a fold out. Engraved forms. Single page addendum with additional information attached to the rear endpaper and signed Rebman Co. 1909. New York, Western and Grand Canals; Maps; 8vo; 212 pages . [Gobe-mouche yetapa, femelle (= plate 296 from Temminck's Nouveau recueil de planches coloriées d'oiseaux ...)]. [France], 1824. Watercolour of a bird on unwatermarked wove paper (ca. 48 x 34.5 cm), standing on a branch signed: "JG Prêtre/ 1824". With plate number and bird name in pencil in lower left corner. For the published work see: Anker 502; Balis, Van diverse pluimage 75; Nissen, IVB 932; Zimmer, pp. 626-628. Original watercolour of a Strange-tailed Tyrant (Alectrurus risora) by the prolific zoological artist Jean Gabriel Prêtre, produced for Temminck's Nouveau recueil de planches coloriées d'oiseaux ... (Paris, 1820-1839). 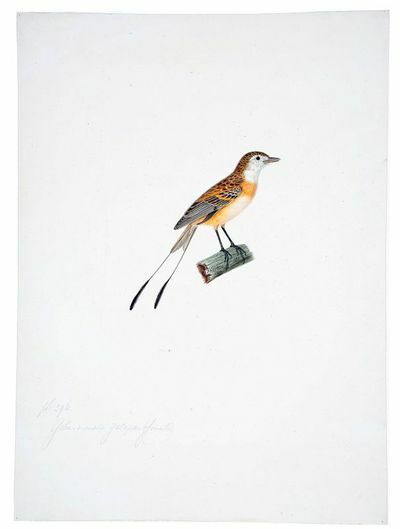 The Strange-tailed Tyrant is a passerine bird of the tyrant flycatcher family found in found Argentina, Brazil, Paraguay and Uruguay.Temminck's lavishly illustrated Nouveau recueil de planches coloriées d'oiseaux ... issued in 102 parts between 1820-1839, was published as a kind of continuation to Buffon's Histoire naturelle des oiseaux (1770-1786). In total it contains ca. 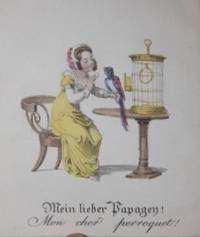 600 engraved plates with about 800 figures of birds by Nicolas Huet and Prêtre, and it's considered "the most monumental work of the post-Napoleonic period" (Balis).Paper slightly browned and sides reinforced. A beautiful watercolour of a Strange-tailed Tyrant. [WATERCOLOUR - ORNITHOLOGY]. PRÊTRE, Jean Gabriel. [Souimanga métallique, mâle & femelle & Souimanga souci, mâle (= plate 347 from Temminck's Nouveau recueil de planches coloriées d'oiseaux ... )]. [France], 1825. Watercolour of 3 birds on unwatermarked wove paper (ca. 48 x 35 cm), all standing on a branch, the middle branch signed: "JG Prêtre/ 1825". With the birds numbered in pencil, and the plate number and bird names in pencil in the lower left corner. For the published work see: Anker 502; Balis, Van diverse pluimage 75; Nissen, IVB 932; Zimmer, pp. 626-628. 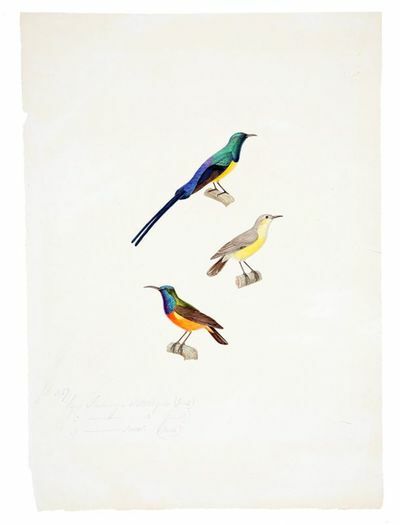 Original watercolour of a male and a female Metallic Sunbird (Anthreptes metallicus) and a male Flame-breasted Sunbird (Cinnyris solaris) by the prolific zoological artist Jean Gabriel Prêtre, produced for Temminck's Nouveau recueil de planches coloriées d'oiseaux... (Paris, 1820-1839). Sunbirds make up a family of very small passerine birds. The Metallic Sunbird, best known as the Nile Valley Sunbird(here named: Souimanga Métallique), are found in north-west Africa and the Middle East, while the Flame-breasted Sunbird (here: Souimanga Souci) is primarily found in Indonesia and East Timor.Temminck's lavishly illustrated Nouveau recueil de planches coloriées d'oiseaux... issued in 102 parts between 1820-1839, was published as a kind of continuation to Buffon's Histoire naturelle des oiseaux (1770-1786). In total it contains ca. 600 engraved plates with about 800 figures of birds by Nicolas Huet and Prêtre, and it's considered "the most monumental work of the post-Napoleonic period" (Balis).Paper slightly browned. A beautiful watercolour of three sunbirds. 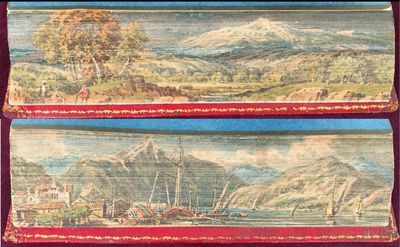 [Fore-edge Painting] COWPER, William (1731-1800). 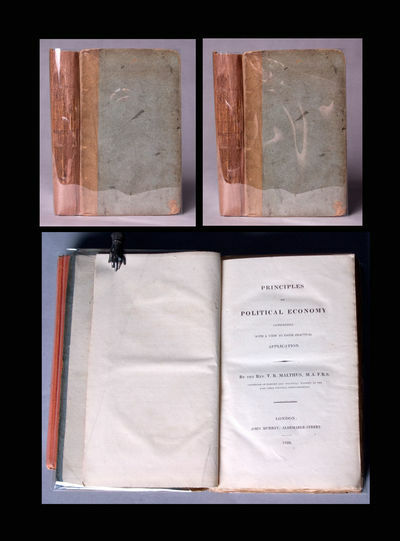 London:: Printed by W. Lewis; Published by W. H. Reid, 1820.. 2 volumes. 8vo. xix, 388; iv, 412 pp. Engraved frontispiece, engr. half-title, 9 engr. plates, woodcut vignettes. Original navy blue blind and gilt-stamped straight-grained morocco, raised bands, gilt-stamped spine and title; rubbed. Armorial bookplate of Anthony Crowdy [�mors pro fide pulchrior�]. Very handsome binding. With two fore-edge paintings of (1) Weston Lodge where Cowper lived in 1786; (2) Weston Hall, seat of Sir George Throckmorton, patron of Cowper. Another pencil note references the text: �I was a stricken deer� � p. 78, ��The love of the Dog� � 209� [the latter, not located in the text]. 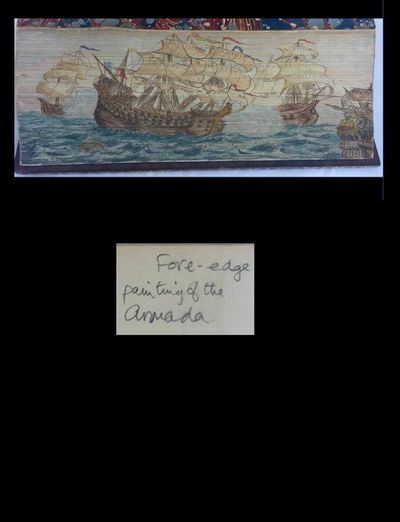 Paintings are not signed or dated � estimated to be 2nd half of 20th century. � PROVENANCE: Anthony Crowdy � Butterfield & Butterfield  (unknown sale date � pre-1999) � current owner. 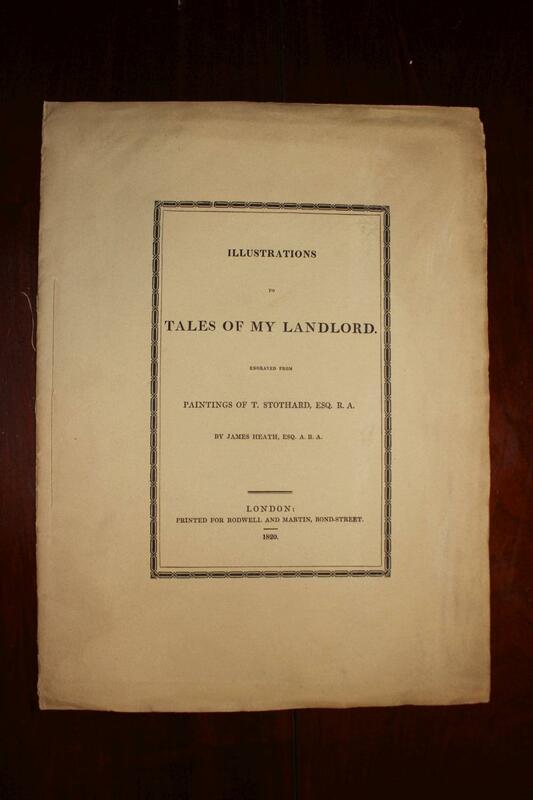 suite de 6 gravures pour Tales of my Landlord. \"Badehaus, Ruinen und Kirche Tharants\". Gesamtansicht mit zahlreichen Biedermeierfiguren im Vordergrund. Lehrbrief mit Gesamtansicht der Stadt von der Isarbrücke am Gasteig, vorne das Zollhaus und die Pfosten des Brückenzugangs, links ein Pferdefuhrwerk, daneben Staffagefiguren, im Hintergrund die Stadt mit Reiterkaserne und allen Türmen, rechts das Hoftheater vor der Theatinerkirche. Im unteren Teil, getrennt durch eine mäandernde Borte, der lithographierte, nicht ausgefüllte Text des Lehrbriefes. 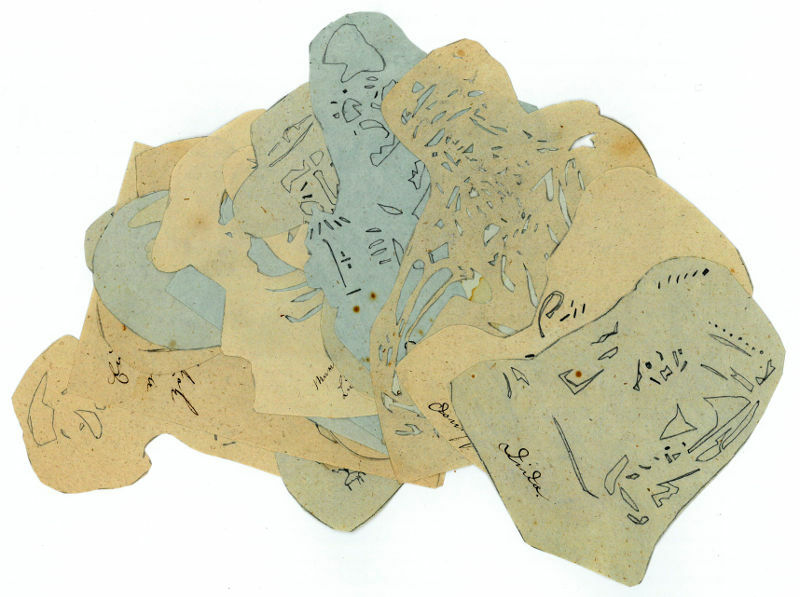 Darstellung und Text sind umrahmt von einer Bordüre mit zahlreichen Gewerbesymbolen. \"Das Schloß zu Heidelberg, gegen Nord Osten\". Im Vordergrund Wäscherinnen vor der Mühle und Männer in einem Kahn. 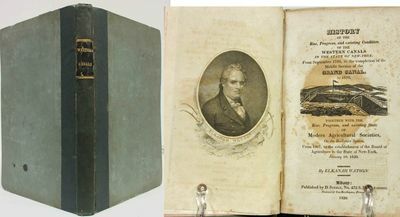 London: Printed for T. Cadell and W. Davies, 1820. n. This edition includes a long introduction giving an account of Defoe's life and works. The plates here have been re-engraved after the earlier illustrations were judged as poor and inaccurate. DNB says that Stothard (1755-1834) "illustrated almost the whole range of English literature with a taste that seldom failed and a sympathy that was often remarkable," attaining "a place which is second to none for invention and grace." 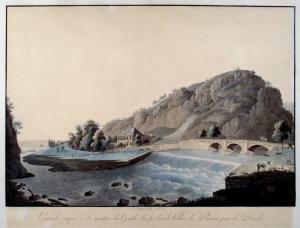 He was a close friend of Blake, and his work often resembles that of his more famous colleague.. 254 x 159 mm. (10 x 6 1/4"). Two volumes. Pleasing late 19th century dark green three-quarter morocco, raised bands, spines gilt in compartments with nautical centerpieces, marbled endpapers, top edges gilt. Engraved title page vignettes and 20 plates (including frontispiece) by Charles Heath after Thomas Stothard, all of the engraved material done on India paper and mounted. A Large Paper Copy. Lowndes I, 614. Spines uniformly faded to olive (vague fading also to parts of the leather on the sides of the volumes), extremities just very sightly rubbed, isolated mild marginal foxing, short closed tear to fore edge of one title page, otherwise a fine copy, the bindings with no significant wear, the leaves clean and fresh, and the engravings with none of the expected foxing. This edition includes a long introduction giving an account of Defoe's life and works. The plates here have been re-engraved after the earlier illustrations were judged as poor and inaccurate. DNB says that Stothard (1755-1834) "illustrated almost the whole range of English literature with a taste that seldom failed and a sympathy that was often remarkable," attaining "a place which is second to none for invention and grace." He was a close friend of Blake, and his work often resembles that of his more famous colleague. No place, no date, but UK, 1820 or afterwards, 1820. Not published; it is probable there was a second volume as stated on the title-page and at the conclusion of the text ("End of First Volume"), but there is an intriguing notation in contemporary hand also on the title-page under "Complete in Two Vols." that states "Not Yet.". Some smudges, browning and light stains; in very good condition. 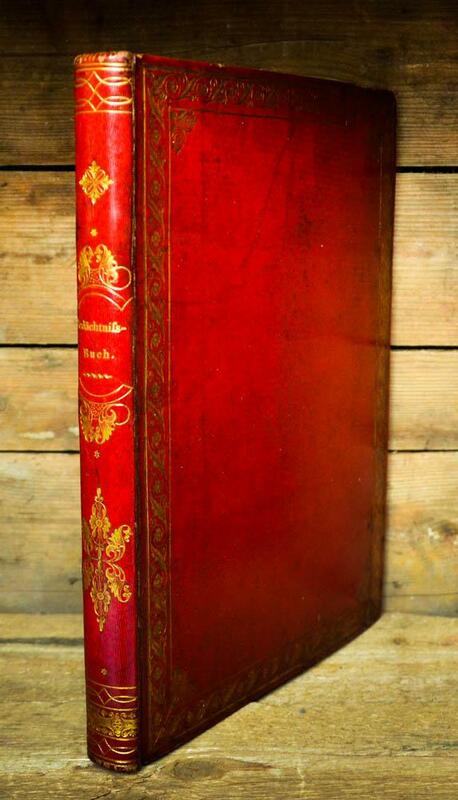 A description with additional photographs is available upon request.. 12mo, 15 x 11 cm, early 19th century diced calf with gilt rules on the upper and lower boards and spine, 155 pages. Decorated title-page, six inserted plates with original art work (three watercolors and three pencil, pen & ink sketches), three vignettes, rubricated chapter heads and ink tailpieces. 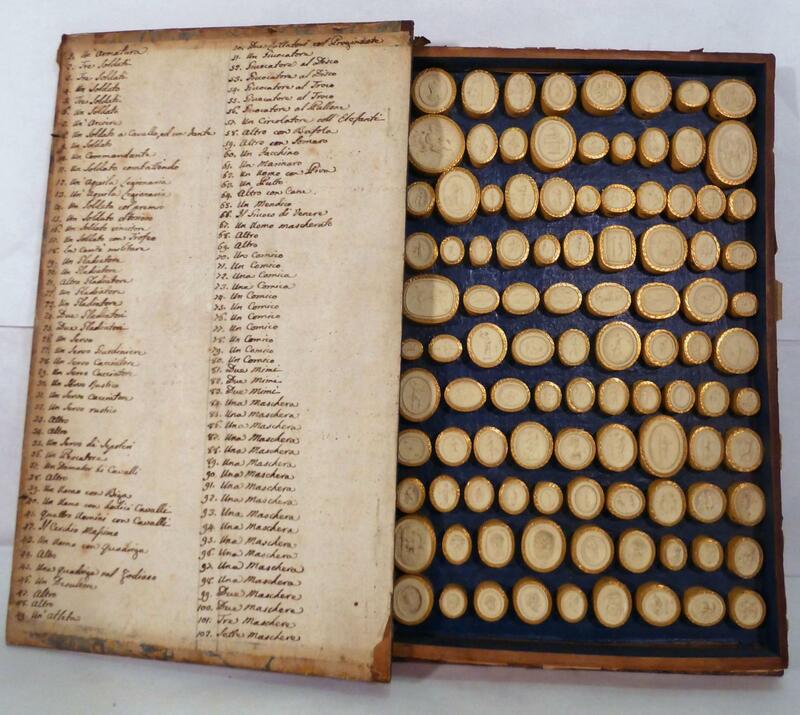 Approximately 15,000 words in a neat hand in brown ink. Minor textual corrections in the same hand, but overall the manuscript appears to be a fair copy. A manuscript novella set in an English country town, "in the year 1820," centering on the lives and intrigues of several young women and men and their romances and adventures. They encounter local gypsies, one of the ladies dies of a mysterious illness, one of the men is dangerously driven to gamble, there are flirtations, jealousies, marriage proposals and the discovery of a long-lost father, who had been imprisoned in an underground grotto. The manuscript is clearly an amateur imitation of the popular Regency novel of manners, but it is not without its charms, and it was carefully composed and illustrated with original (also a bit amateurish) art. 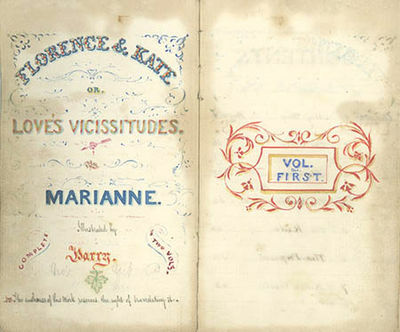 The manuscript has the appearance of a friendship album with its decorative lettering and artwork. 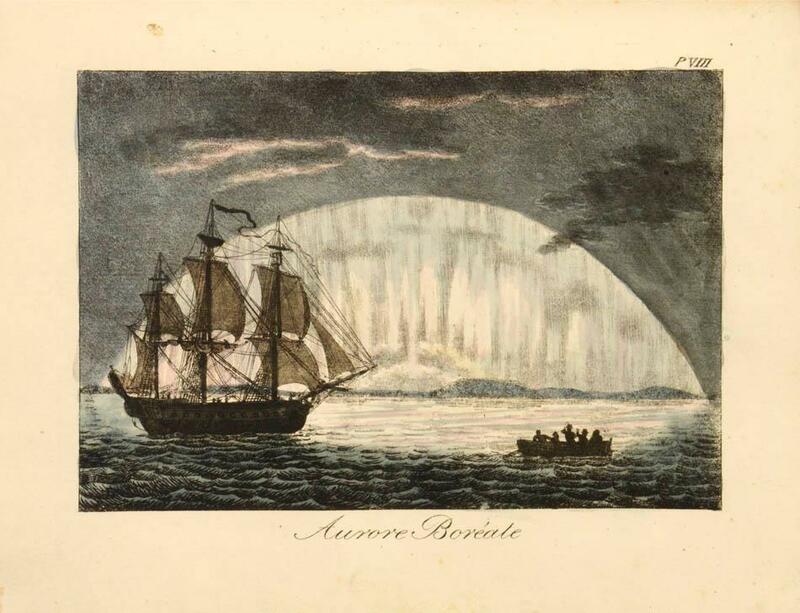 Rodwell & Martin, London 1820 - Hand-coloured aquatint by Robert Havell & Son, after Fraser. Several skillful marginal repairs, not affecting the image. A fine example of a view taken during the first recorded journey by Europeans through the Himalayas. Fraser wrote of this place, said to the source of the Ganges, "We were now in the centre of the stupendous Himalas, the loftiest and perhaps the most rugged range of mountains in the world. We were at the source of that noble river, equally an object of veneration and a source of fertility, plenty and opulence to Hindustan; and we had now reached the holiest shrine of Hindoo worship which these holy hills contain." In 1815, following the end of the war with Nepal, Fraser and his brother William, a political agent, spent two months on a tour of the Himalayas. Their journey took the brothers along the river valleys of the Himalayas, with occasional sorties to higher latitudes and as far as the sources of both the Jumna and Ganges rivers. 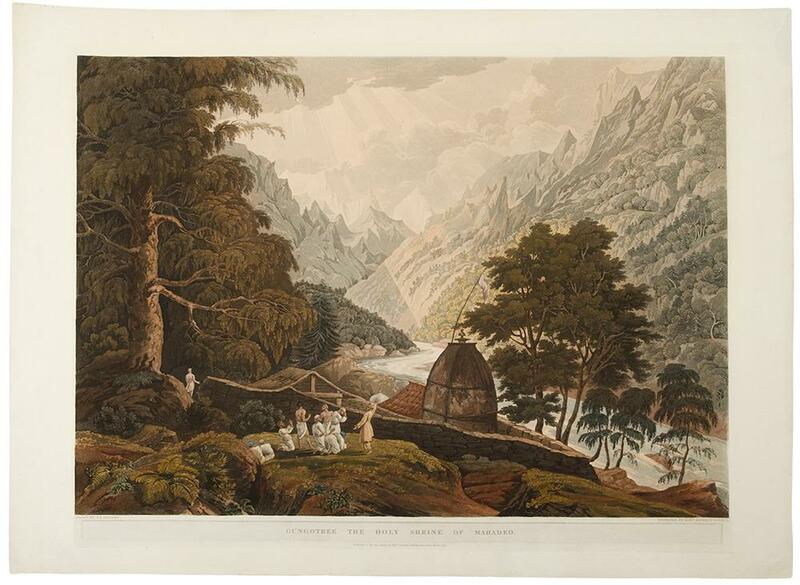 This view is from the spectacular Views in the Himala Mountains which contains twenty of Havell's masterly plates worked up from sketches made on the spot by Fraser. In style the plates are similar to, and very much a match for Henry Salt's and the Daniell brothers' large scale views published 10 and 20 years earlier. This was a deliberate strategy by the publishers who drew attention to the similarities in their advertisements which describe the work as being `In Elephant Folio, uniform with Daniell's Oriental Scenery, and Salt's Views in Abyssinia.' Cf. Abbey Travel II, 498. Marseilles: chez Antoine Richard. Very Good. 1820-21. First Edition; First Printing. Hardcover. 3 vols. 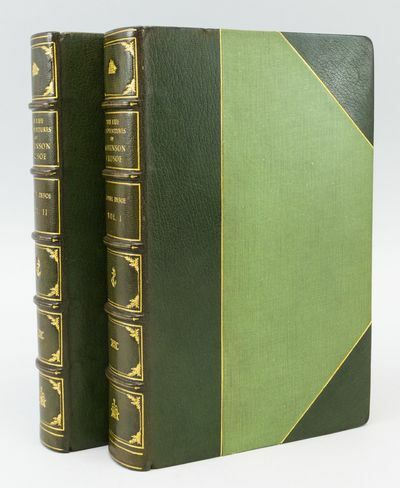 pages; Three volumes bound in contemporary half calf over marbled paper-covered boards with tiny vellum tips reinforcing the corners, flat spines -- each volume has a pair of green leather labels lettered in gilt. These three volumes once belonged to Dr. Arpad Plesch, with the great collector's impressive red leather book-label tooled and lettered in gilt mounted to the front paste-down of the first volume. 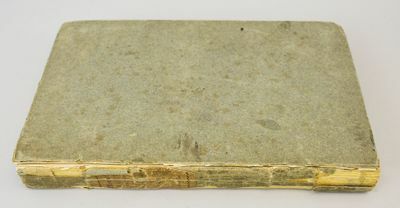 The spine of the first volume has a small piece missing along the top edge and has recieved a minor repair, there is a surface scrape along the spine of the third volume, which is not particularly noticeable, and there is moderate worming to the blank margins (only) of 57 leaves towards the end of the volume. In general, this copy is handsome and sound. 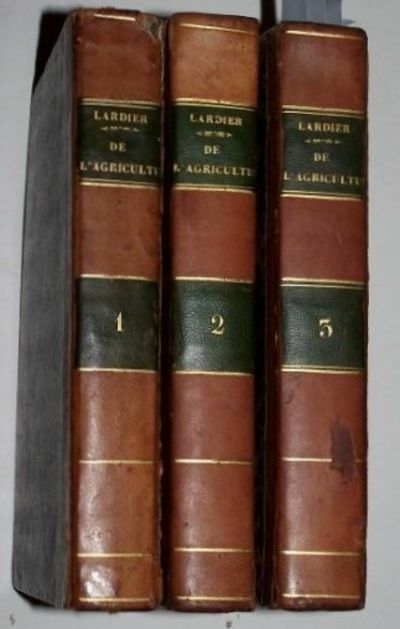 While these volumes would be of considerable interest as a representation of the state of agriculture in the south of France in 1820, the material at the heart of the third volume represents an important and early treatise on all aspects of the variety and cultivation of grapes, and winemaking. The text goes into significant detail -- how to build, support and work vineyards, the varieties of grapes and their suitability to the terrain and climate, diseases and problems ith grapes, wine bottles, corks, basements, cellars, tanks, vinegars, distillation and fortification, etc. Little is known about the author, J.-S. Lardier, but at least one reference relates that he was born in 1753 and that he was Provençal. Lardier's "Essai," while a classic work of French agriculture (and viticulture), is both rare and unusual in its form -- to the extent that various sources cannot agree, even, on just what constitutes a set. The Bibliothèque Nationale copy seems to have only the first two volumes [but as it does not specify pagination details, their catalogue description makes it impossible to say just what they have, or do not have]. Quérard, 4:557 (compiled just a decade after this publication appeared) cites only two volumes ("5 livraisons en 2 volumes"), and gets the dates a bit mixed up. Oddly, the title page to Vol. 2, has an imprint dated "1821;" vols. 1 and 3, title pages have the date: "1820." Some of the confusion seems to result from the evidence that this publication was issued in parts -- [called here "livraisons"]. Our copy has ten livraisons. The first leaf of each of the octavo gatherings, marked with a number at the foot of the page, also has the specification of the particular livraison number. At the end of our volume III, at the foot of the final paragraph of the text appears this note: "Fin de la dixième livraison." But it should be noted that we found only one record of an institution holding individual livraisons or issues of the parts of Lardier's "Essai" -- [Médiathèque Draguignan has 3 parts, broché] . Not many of the examples bound into volumes have survived, either. COPAC locates just a single example: [Senate House Libraries, University of London, apparently just volume I]. OCLC appears to have 8 different accession numbers, but this is highly misleading as 5 of the 8 describe only libraries reporting a modern microform facsimile reprint, which appears to have included volume I only: [Goldsmiths' Library, University of London./ Goldsmiths'-Kress no. 22806./ Electronic reproduction./ Farmington Hills, Mich. :/ Thomson Gale]. OCLC does locate five sets printed in the early 1820's on paper. (Northwestern University; Indiana University, Bloomington; Muséum National d'Histoire Naturelle de Paris; Bibliothèque municipale de Lyon; and the aforementioned Bibliothèque Nationale set (2 vols. only). To confuse matters further, it appears that two sets recorded have four volumes -- [Northwestern University, and Bibliothèque Universitaire de Pharmacie. Both have the date "1821" on that fourth title page. 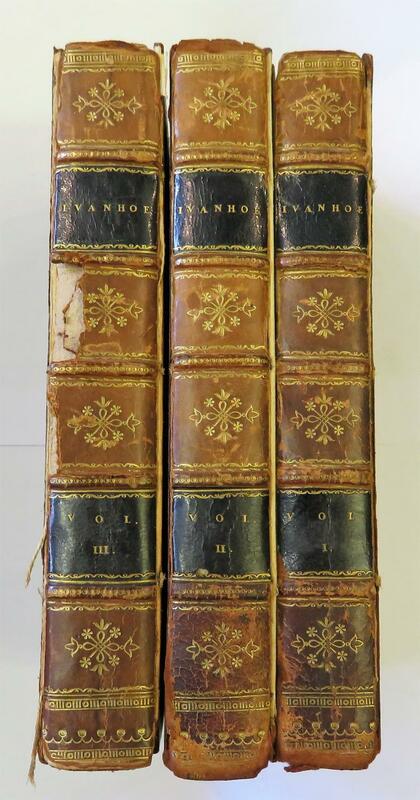 Another set in four volumes appears to have been sold at auction in Paris at Alde, June, 2014]. 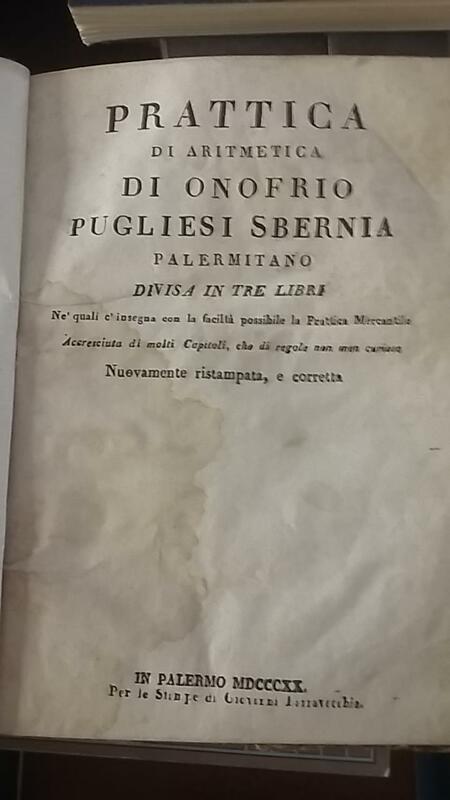 Volume IV, missing in nearly all sets, including ours, was devoted to further details about individual fruits (not grapes or winemaking) and it also has a significant section on olives and their cultivation. 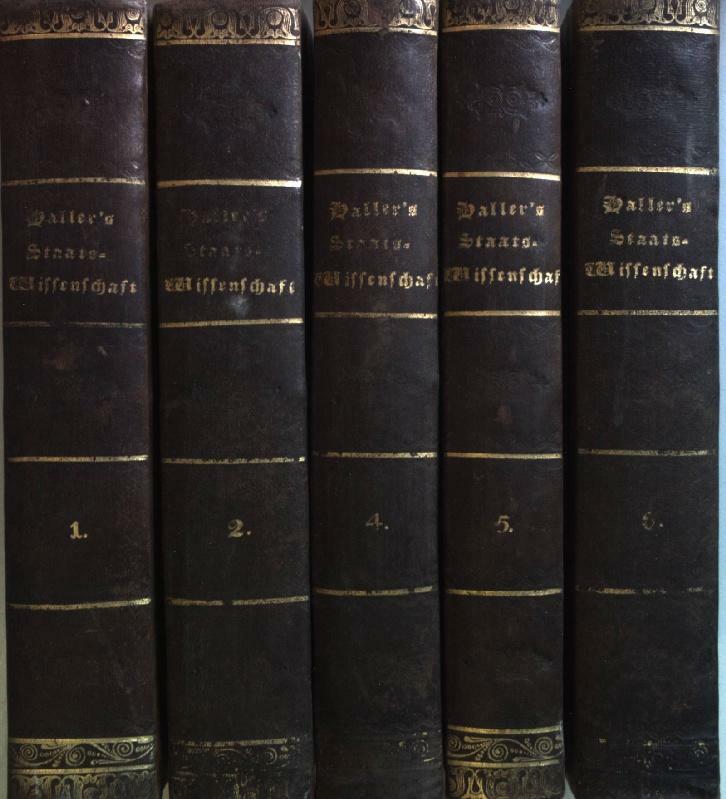 Perhaps to make up in part for the lack of this, the first owner of our set had bound up at the end of the first volume a slightly later pamphlet on the subject: "Lettres d'Antoine David sur les oliviers. Nouvelle édition avec des notes de M. Feissat aîné" -- Marseille : Imp.-Libr. Feissat, 1832. 60 pp. (OCLC Number: 369089176, 3 locations only: Harvard; Bibliothèque Nationale; and Bibliothèque municipale de Lyon). After the final leaf of this rare inclusion, our copy has a leaf titled "Explication des Figures" -- the 3 plates in our copy are each placed as directed on this leaf. These plates are lithographs, with multi-figures -- ("Buisson d'après Grive') and are all in fine condition. Each of our volumes has errata at the end. While it would be preferable to find a set with the elusive fourth volume, it is worth noting that the vastly wealthy Dr. Arpad Plesch (18891974), who formed one of the great collections ever assembled of botanical books, determined that this copy met his standards. Precise collation available upon request. .
Unbeschriebene Blätter in prächtigem Einband. 74 Blatt. Halbleder der Zeit mit aufgezogenem orig. Broschurumschlagdeckel (berieben und bestoßen, teils, die Kanten stark, beschabt, die Kapitale mit Fehlstellen, das Titelblatt mit Quetschfalte, die Innengelenke angebrochen, etwas, vor allem die Ränder der Karten, stockfleckig, vier Karten mit unterlegten Randrissen, sonst ordentliches Exemplar) Quer-4. Erste vollständige Ausgabe des legendären Atlas, wie stets in Plano. Es fehlen die Karten 30, 31 und 38 B, dafür ist die Karte 40 zwei Versionen vorhanden (1820 & 1828). - Vgl. Espenhorst AS 66ff und PP I, 224ff [jeweils ausführlich]. ENGELMANN, Godefroy (1788-1839); G. Berger. c : contenant des planches pour la géographie mathématique, des dessins représentant les principales curiosités de la nature, ainsi que les costumes, moeurs et usages des peuples les plus remarquables . le tout exécuté par les procédés lithographiques et soigneusement enluminé, accompagné d'un texte explicatif et de tableaux synoptiques propres à faciliter l'usage de cet ouvrage dans l'enseignement de la jeunesse. Le Palais Royal, Optique No. 9. A very attractive 3-D 'Optique' or 'Peepshow'. Ca 1820. There are six divisions with a hand-coloured engraving of the front elevation of the French Royal Palace at Versailles mounted on the upper board. With one central and two other peep-holes at either side, through which are viewed people walking through the gardens of the palace and the open colonnades on either side, including a view of a large fountain and statues. Paper concertina sides, 13 x 19 cm, depth when extended approx 48 cm. Minor repair to back edges, a very good copy in the original marbled card slipcase, with an engraved label. HOCHZEIT., "Le Demande de Noce". 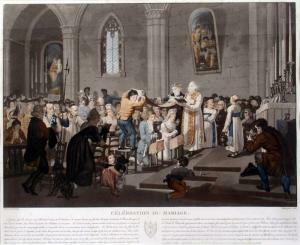 "Célébration de Mariage". "Le Retour d l'Eglise". "Le Repas de Noce". Darstellung einer ländlichen Hochzeit in vier Blättern. \"Le Demande de Noce\". 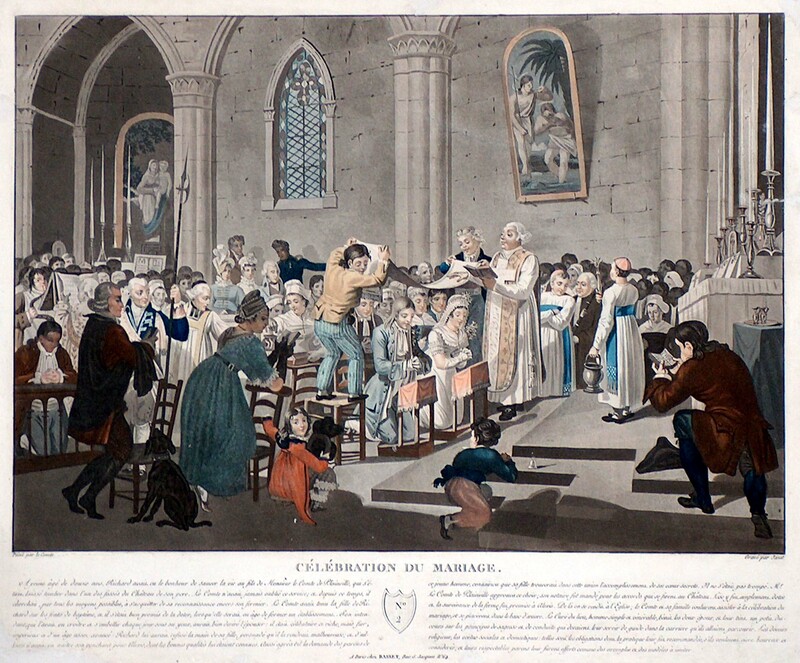 \"Célébration de Mariage\". \"Le Retour d l`Eglise\". \"Le Repas de Noce\". Darstellung einer ländlichen Hochzeit in vier Blättern. JAHRESZEITEN. - Winter., "Die Freuden des Winters. - Die Tätigkeiten im Winter". Zwei Gegenstücke mit winterlichen Szenen. 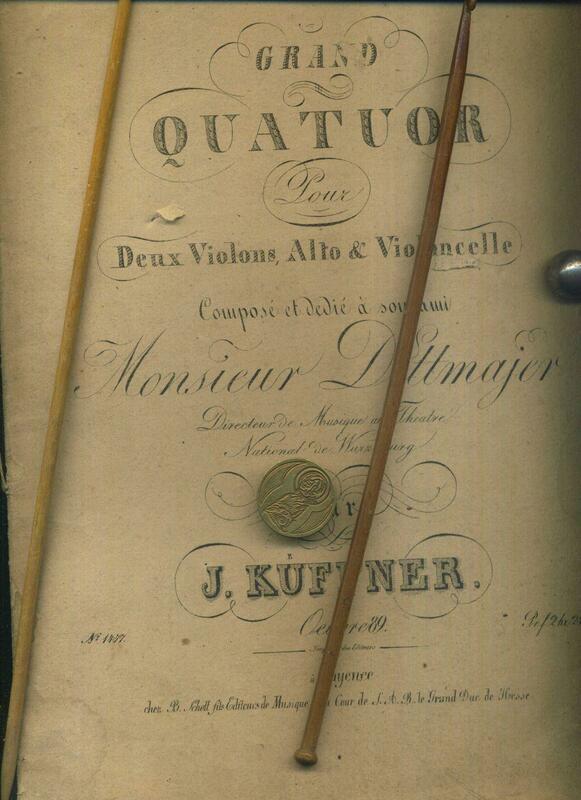 Grand Quatuor pour deux Violons, Alto et Violoncelle, composés et dédiés à son ami' Monsieur Dittmajer / Dittmayer. Mayenee 1477. Gestochene Noten auf Büttenpapier. Mayenee, um 1820., o,J. - 30 x 24 cm. 4 Hefte ISBN: Keine. Noten auf Büttenpaier. Unbeschnitten. Einzelne Langen lose im Einbandpapier. No jacket. Guter Zustand / Good condition. Eingestaubt und leicht berieben teileweise fleckig, ecken gerundet. 1. Auflage, Sprache: de. * Versandfertig innerhalb von 20 Stunden! * Joseph Küffner war ein deutscher Musiker und Komponist. Küffner entstammt einer fränkischen Musikerfamilie, sein Vater war Hofkapellmeister in Würzburg. Er war als Violinist im Würzburger Hoforchester tätig und trat auch als Solist auf. Geboren: 31. März 1776, Würzburg // Gestorben: 9. September 1856, Würzburg. Priv4. (TS). Berlin : Simon Schropp et Comp, 1820. 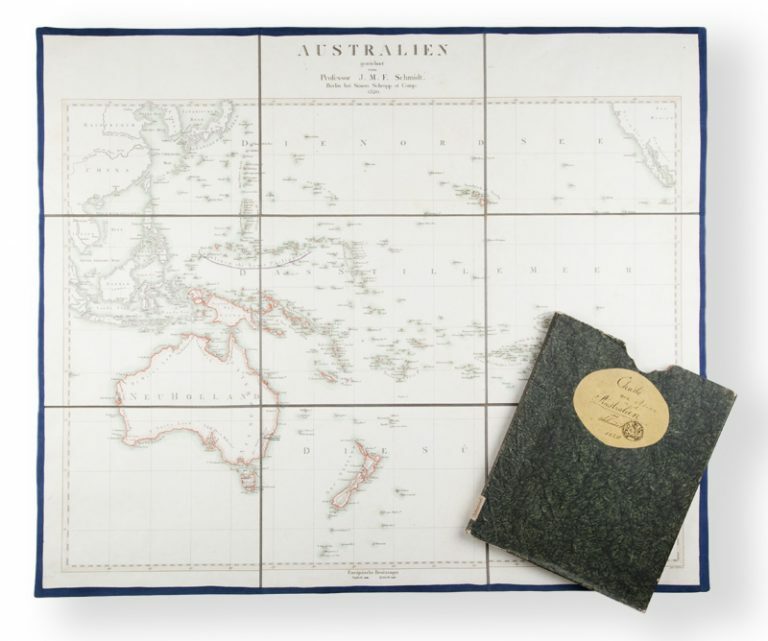 Engraved map, hand-coloured, 430 x 580 mm, dissectedinto 9 sections and laid down on linen; original marbledcard slip case with manuscript label Charte von Asien undAustralien von Schmidt 1820, bearing the stamp of theFurstlich Von der Leyen Bibliothec - The private library ofthe German aristocratic family Von der Leyen, foundedaround 1760. The regions of Neu Holland include De Witt’sLand, Edel’s Land, Lowinn Land and P. Nuyt’s Land along theWestern coastline. The Swan River, Hawkesbury River andBlue Mountains are all shown. Fine. Tooley 1125. Of population. 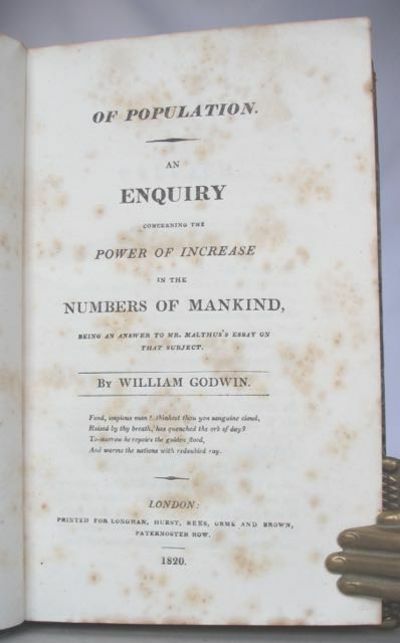 An enquiry concerning the power of increase in the numbers of mankind, being an answer to Mr Malthus's essay on that subject. London, Longman, Hurst, Rees, Orme and Brown, 1820. 8vo., (2) + 22 + 626pp., including the half-title, two or three leaves at both beginning and end a little foxed, contemporary half calf over marbled boards, neatly rebacked to match reusing the original spine label. A very good copy. First edition. A strongly argued attack on both the principles and statistics of Malthus's Essay>. It was referred to frequently in the Parliamentary and public debate which followed the introduction of James Scarlett's Poor Relief Bill in May 1821. Patricia James [Population Malthus>] chronicles the debates which proceeded along 'Populationist' and 'Anti- Populationist' lines, with Godwin's 'elaborate work' being quoted in support of the former. [Traquet oreillard, Traquet à queue noire & Traquet leucomèle (= plate 257 from Temminck's Nouveau recueil de planches coloriées d'oiseaux ... )]. [France], 1823. Watercolour of 3 birds on unwatermarked wove paper (ca. 48 x 35 cm), all standing on a branch, the lowest branch signed: "JG Prêtre/ 1823". With plate number in pencil in the lower left corner. For the published work see: Anker 502; Balis, Van diverse pluimage 75; Nissen, IVB 932; Zimmer, pp. 626-628. 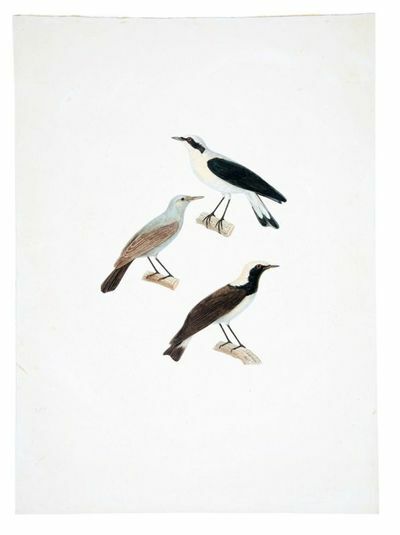 Original watercolour of a Black-eared Wheatear (Oenanthe hispanica), a Blackstart (Oenanthe melanura) and Pied Wheatear (Oenanthe pleschanka) by the prolific zoological artist Jean Gabriel Prêtre, produced for Temminck's Nouveau recueil de planches coloriées d'oiseaux... (Paris, 1820-1839). The Black-eared Wheatear and the Pied Wheatear are both small migratory passerine birds. The Black-eared Wheatear is found in northern Africa, southern Europe, and from the Middle East to China, and the Pied Wheatear in eastern Europe and Asia. The Blackstart, also described as belonging to the genus Cercomela instead of the genus Oenanthe, is a small passerine bird found in desert regions in North Africa, the Middle East and the Arabian Peninsula.Temminck's lavishly illustrated Nouveau recueil de planches coloriées d'oiseaux... issued in 102 parts between 1820-1839, was published as a kind of continuation to Buffon's Histoire naturelle des oiseaux (1770-1786). In total it contains ca. 600 engraved plates with about 800 figures of birds by Nicolas Huet and Prêtre, and it's considered "the most monumental work of the post-Napoleonic period" (Balis).Paper slightly browned. A beautiful watercolour of three wheatears. - altkol. Aquatinta v. Jazet n. le Comte, um 1820, 29,8 x 43,1 Das Blatt zeigt die Hochtzeitszeremonie in der Kirche. Das Brautpaar kniet vor dem Altar. Zwei Jungen halten ein Tuch über das Paar. - Sauber koloriert und farbfrisch. Einige Einrisse fachgerecht restauriert. Mit siebenzeiligem Text unter der Darstellung. Spiele und Vergnügungen der kindlich-frohen Mädchen im ersten Alter. Ein unterhaltendes Bilderbuch mit kurzen Erzählungen und 18 schön colorirten Kupfern. Jeux et Amusemens des Filles en Bas-&Acirc;ge. 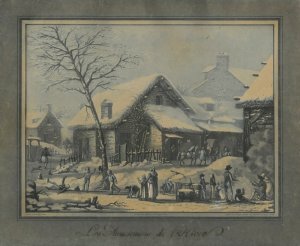 Libre compos&eacute; d&#146;historiettes courtes et amusantes, et orn&eacute; de 18 gravures colori&eacute;es. Nottingham: J. Dunn, 1820. FIRST EDITION. The 11 letters here were written with the intent of discouraging prospective British emigrants from seeking their fortunes in the new United States. Howitt crossed the Atlantic with his brother in 1819, and toured the country between Boston and Baltimore, finding little to recommend settling in the new country. He was unimpressed by agriculatural prospects, deploring the climate and the soil, was dismayed by disease, rattlesnakes, and primitive conditions, and was absolutely appalled by the institution of slavery. He found native-born Americans arrogant and likely to cheat the emigrant; in general, as Howes observed, he took "a dim view of the Republic, especially the back woods regions." The final letter addresses the theory, espoused by William Penn and others, that American Indians were descended from the lost tribes of Israel, and discusses similarities between Native languages and Hebrew.. 190 x 114 mm. (7 3/8 x 4 1/2"). xxi, [i], 230 pp. FIRST EDITION. Publisher's blue boards, (most of) paper label on spine. In a modern turquoise cloth clamshell box with brown label on spine. Remnant of ex-libris on front flyleaf. Howes H-740; Sabin 33372. Front board detached, boards somewhat foxed and soiled, much of the paper chipped off spine, one gathering a little foxed at head of gutter, isolated rust spots or smudges, otherwise an excellent copy internally, clean and fresh. The 11 letters here were written with the intent of discouraging prospective British emigrants from seeking their fortunes in the new United States. Howitt crossed the Atlantic with his brother in 1819, and toured the country between Boston and Baltimore, finding little to recommend settling in the new country. He was unimpressed by agriculatural prospects, deploring the climate and the soil, was dismayed by disease, rattlesnakes, and primitive conditions, and was absolutely appalled by the institution of slavery. He found native-born Americans arrogant and likely to cheat the emigrant; in general, as Howes observed, he took "a dim view of the Republic, especially the back woods regions." The final letter addresses the theory, espoused by William Penn and others, that American Indians were descended from the lost tribes of Israel, and discusses similarities between Native languages and Hebrew. PLAUEN., "Cascade auprès de la maison du Garde-chasse dans la Vallée de Plauen près de Dresde". Blick über den Wasserfall auf zwei Häuser, rechts Brücke mit zwei Reitern. Philadelphia: Joseph Rakestraw (tract 2), 1820 and 1822. Hardcover. Very Good. Hardcover. Second tract published by Joseph Rakestraw. RARE AMERICANA. This volume includes two tracts written in 1820 and 1822 that provide an engrossing account of an important debate of the day on whether the Bible requires the observance of the Sabbath and, if so, whether it is proper for a civil government to enforce this observance. Tract one reprints the text of an essay appearing in the Boston Patriot that holds the position that the enforcement of the Sabbath is "not warrantable from Scripture." It is followed by two responses in disagreement. The second tract of essays on the Sabbath's observance first reprints the Boston Patriot essay, and then prints several essays for and against the position of the writer in the Boston Patriot. Both tracts are in very good condition, with aging and some foxing. The front and rear pages of tract two are more heavily foxed. There is also foxing to the front and rear pastedowns. In a later black cloth binding with very light bumping and rubbing and the gilt title "Sunday Police" to front board. Tract one: 36 pages; tract two: 48 pages. 12mo. Black cloth boards with gilt title to front board. AMHIST/022609. Batavia, Ter Lands Drukkerij, 1820. 8vo (18.6 x 12.5 cm) 266 pp., 59 pp. Voorbericht, 23 pp. Nabericht and Bladwijzer. 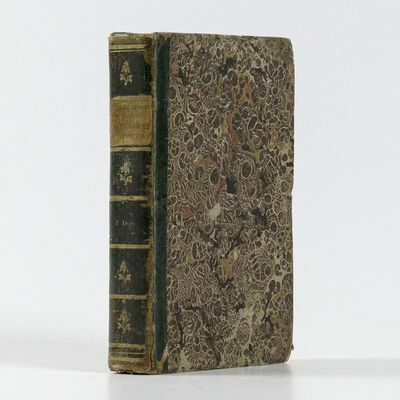 Contemporary half calf with mottled paper over boards.= Rare first volume of this series of Asian studies begun in 1779, and completed in 1950. This is the first reprint, published in Batavia, whereas the 1st edition was published in the Netherlands. Includes: Baron van Wurmb, De orde der Palmboomen; Josua van Iperen, Beschrijving van een witten Neger; Register der geslagten van drie rijken der Natuur naar de 12e druk van Systema Natura van Car. Linnaeus tot de Vegetablilia, vervolgens naar de Herbarius Ambonensis dealing with Animalia, Vegetabilian, Mineralia in three languages - Malaysian, Dutch and Latin - and dealing mainly with the natural history of Southeast Asia; J. Radermacher and W. van Hogendorp, Beschrijving van het Koningrijk Jaccathra and Stad Batavia; W. van Hogendorp, Beschrijving van het eiland Timor. Wear to bottom headcap, joints and corners. Very light waterstain to tops of pp 49 (Voorbericht) - 24, 47-82, otherwise text block is clean and in fine condition. Gilt labeling on spine, title on paper label. A rare edition of 18th century observations of natural history in present-day Indonesia in good condition. Restauration der Staats-Wissenschaft oder Theorie des natürlich-geselligen Zustands der Chimäre des künstlich-bürgerlichen entgegengesezt (KONVOLUT aus 5 Bänden) - hier vorhanden Bd.1-2; 4-6 (OHNE Band 3).